This image shows the core of galaxy Messier 82 (M82), where two ultraluminous X-ray sources, or ULXs, reside (X-1 and X-2). ULXs are regions that shine intensely with X-rays. Astronomers previously believed that all ULXs were the result of actively feeding black holes; as the black holes pull matter onto them from companion stars, the matter heats up and blazes with X-rays. NuSTAR has added a new twist to the mystery of ULXs by showing that one of the ULXs in M82, called M82 X-2, is not a black hole but a pulsar. 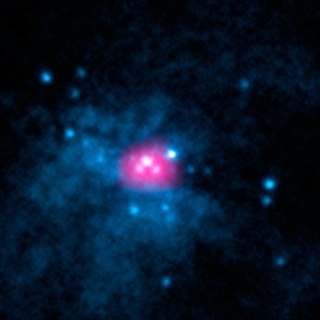 The observatory's high-energy X-ray observations caught a telltale pulse of X-rays coming from the object. A pulsar is a leftover core of an exploded star that sends out rotating beams of high-energy radiation. Pulsars are not as massive as black holes, so researchers are confounded by the immense amount of radiation pouring out of this relatively puny, compact object. Meanwhile, other researchers, using data from NASA's Rossi X-ray Timing Explorer, recently found evidence that the other ULX in M82, called M82 X-1, is indeed a black hole. They think it might belong to a long-sought intermediate-mass class -- a missing link between smaller, stellar-mass black holes and the gargantuan ones that dominate the centers of most galaxies. Together, these results suggest that ULXs may be more diverse than once believed. The image is a combination of high-energy X-ray data taken by NuSTAR (pink) and lower-energy X-rays captured by NASA's Chandra X-ray Observatory (blue).